Another wonderful looking book for those interested in jurisprudence and comparative canon law studies by Fr. 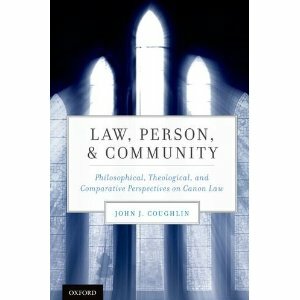 John Coughlin (Notre Dame), Law, Person, and Community: Philosophical, Theological, and Comparative Perspectives on Canon Law (OUP 2012). For Coughlin’s other recent book about canon law, see here. The publisher’s description follows. Law, Person, and Community: Philosophical, Theological, and Comparative Perspectives on Canon Law takes up the fundamental question “What is law?” through a consideration of the interrelation of the concepts of law, person, and community. As with the concept of law described by secular legal theorists, canon law aims to set a societal order that harmonizes the interests of individuals and communities, secures peace, guarantees freedom, and establishes justice. At the same time, canon law rests upon a traditional understanding of the spiritual end of the human person and religious nature of community. The comparison of one of the world’s ancient systems of religious law with contemporary conceptions of law rooted in secular theory raises questions about the law’s power to bind individuals and communities. Professor John J. Coughlin employs comparative methodology in an attempt to reveal the differing concepts of the human person reflected in both canon law and secular legal theory. Contrasting the contemporary positivistic view of law with the classical view reflected in canon law, Law, Person, and Community discusses the relationship between canon law, theology, and natural law. It also probes the interplay between the metaphysical and historical in the theory of law by an examination of canonical equity, papal authority, and the canon law of marriage. It juxtaposes the assumptions of canon law about church-state relations with those of the modern liberal state as exemplified by U.S. first amendment jurisprudence. No scholarly work has yet addressed this question of how the principles and substance of canon law, both past and present, relate to current issues in legal theory, such as the foundation of human rights and in particular the right of religious freedom for individuals and communities.